Have you ever heard of Sportsbet.io? It is clean, it is efficient and it is easy. These are the three things that we noticed about this website. If you are familiar with online Sportsbook websites, then you know what we are talking about. Today, we will be reviewing everything about this website. How long have they been providing service? What features do they have that differentiates them from the rest of the gambling websites today? And last but not the least, do they provide good customer service? We will try to answer all of these questions above within this review. So what are we waiting for? Let’s start exploring the website together! 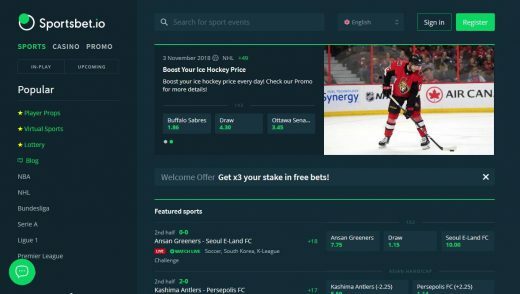 What is Sportsbet.io? They are a gambling website that specializes in sports betting and probably one of the leading sports book websites that accepts Bitcoin as a payment method. The website takes advantage of what crypto currency has to offer when it comes to safety and security for transactions. The website is a fairly new one since it just started to operate in 2016 to provide players a place to bet on their favorite sporting events with the use of Bitcoin. The website is registered as mBetSolutions N.V., with the regulations of the Government of Curacao. The first thing that you would notice about this website is the fact that it is designed properly, we should give them that. Compared to other websites that we have written a review about, this is probably one of the best layouts that we’ve ever seen so far. Everything is properly segregated in their respective tabs, thus making it easier for us to know which is which. If any of you can recall previous reviews, we came across websites that are just seriously messed up. So far, this website is doing well in this department. Let us know take a look at their available sporting events. We were expecting something like more than a thousand betting lines to choose from, but we got an ample amount of listed events. Again, the neatness and website layout speaks a thousand words. Here are the available sports events that we are able to place a wager on: Soccer, Tennis, Basketball, Ice Hockey, American Football, Alpine Skiing, Badminton, Bandy, Baseball, Boxing, Bowls, Counter-Strike, Cricket, Darts, Dota 2, Floorball, Golf, Handball, Futsal, League of Legends, MMA, Rugby, Snooker, Specials, Squash, Table Tennis, Volleyball and Waterpolo. Aside from the general list of sporting events, below are their featured sports that can be easily spotted due to its strategic location on the upper left-hand side of the website. Tennis – Their Tennis events are not as many as some other sports betting websites. They have ATP, ITF Men, ITF Women, WTA, and Challenger (Fairfield, Buenos Aires, Ortisei, Tashkent) on the day this review was written. European Major Soccer – Probably the most watched sporting event in sportsbook history! Here they offer Football events such as England – Premier League, Spain –La Liga, Italy – Serie A, France – Ligue 1, Germany – Bundesliga, and Portugal – Primeira Liga. Ice Hockey – Ice Hockey is a huge sporting event in North American and Europe, making it a staple to every sport betting websites today. Available Ice Hockey events are Germany DEL, Sweden SHL, Austria EHL, USA NHL, Russia KHL, Russia VHL, and Russia MHL. MLB – Major League Baseball is not only huge in the United States but in Japan as well. Though Sportsbet only provides lines for the USA MLB events. American Football – Of course, the all-time American favorite betting game can be found in Sportsbet.io. The available events that are available to bet on are NFL and College Football. eSports – Due to the obvious market demand for eSports betting today, they also have a separate tab dedicated to this exotic sporting event. They offer betting lines for CS: GO, League of Legends, and StarCraft. eSports events are being held in different locations around the world today, automatically making it a magnet for people that love to bet. Since the eSports scene is very competitive, the chances of winning aren’t that small even if you do not bet on the “famous teams”. To get an idea of how serious eSports competitions are today, please click this link and see how much these teams have earned. In addition to being a Sportsbook, they also offer online casino services which will be discussed later on in this review. Their website is also mobile-friendly, which makes it easier for people to just “carry” their bet slips with them wherever they want to go. And with the popularity of mobile applications, it was the right choice for the company since it would be very convenient for registered users to check on their bets on the go. The review is mainly for their Sportsbook, but we need to cover their additional features as well. One of the main features is that this website is not only a sports betting website but an online casino as well. 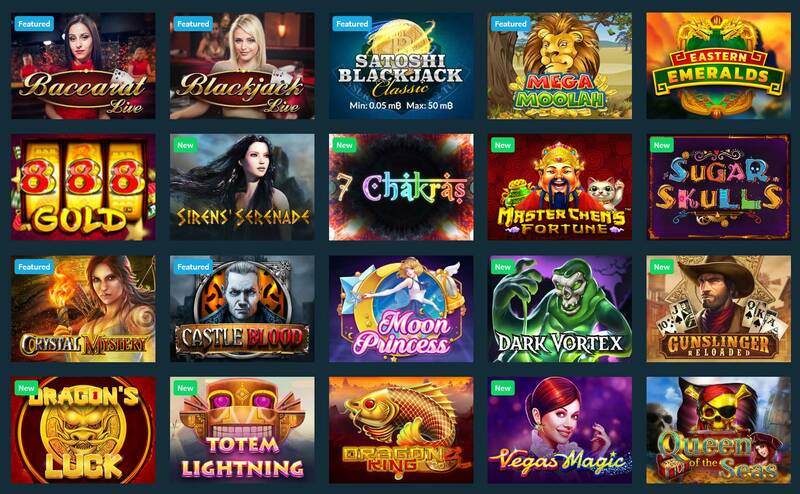 We will be looking into the available games that we are able to play in their casino tab. All Games – This tab was specially made for people that would just like to browse the whole enchilada. If you do not have a game in mind, click this tab and start browsing until you find something interesting to play. Blackjack – It is great to see a separate tab for Blackjack since not all online casino websites offer this exclusivity. To name a few table titles we’ve got Satoshi Blackjack, Bitcoin Blackjack, High Roller Blackjack, Single Deck Blackjack BSG, Super 7 Blackjack, OneTouch Mini Blackjack, Pirate 21, and a lot more! See the whole list of Blackjack games here. Video Slots – Their video slot tab is filled with colorful titles to choose from. To name a few we’ve got Money Farm 2, Mermaids Diamond, Golden Girls, Blood Eternal, Booming Bananas, Fire and Steel, Wunderfest, Wild Spells, Viking Runecraft, Fairy Gate. Jackpot Slots – Some people would particularly look for this tab due to the obvious reasons, the jackpot payouts are amazing! Here are some game titles under this tab Wild Spells, Mega Glam Life JP, Fruit Bonanza, Bell of Fortune, Speed Cash, Gunslinger, Mr. Vegas Mini, Golden Goal, Gift Shop, and a lot more. Roulette – What we’ve noticed about the other online casino websites out there today is that they do not have enough Roulette tables to go around with. Here, you get a whole tab dedicated to Roullete gaming! Click here to see their available tables. Live Dealer – Our favorite part of an online casino. This area completely disappointed us due to the fact that they only have one game provider, which is Evolution. They only have four tables and these are namely Evolution Roulette, Evolution Baccarat, Evolution Casino Hold’em, and Evolution Live Casino Blackjack. Just an advice, do not forget to enable your flash player to be able to play live casino games. Video Poker – Yet this tab is another surprise when it comes to volume. Their video poker tab contains more than four dozen titles that you are able to play around with. Available game titles such as Multihand Double Jackpot, Bonus Deuces, Multihand Bonus Deluxe, Multihand Jacks or Better, Deuces Wild Multihand, Joker Poker, and a lot more. Baccarat – This tab is a surprise of its own. We weren’t expecting more than a couple of tables for players to choose from. Here at Sportsbet.io they have about a dozen of titles to go around with. 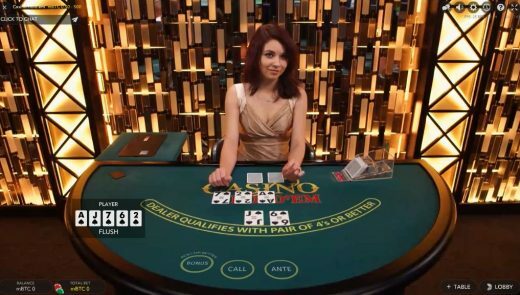 Tables Games – Their table games tab contains Poker games such as Oasis Poker, Pai Gow Poker, Ride’Em Poker, Three Card Rummy, and a lot more. Just a side note, they should rename this tab into “Poker Games” instead. Their online casino is perfectly designed and not cluttered. Minus the “Table Games” that had only poker games in it, the casino area was perfect. To end the casino tour of sportsbet.io, here is a picture of a live poker game. People say that when a gambling website doesn’t offer any bonuses, this is a really dull website. We strongly agree with this statement. Why? Only a fool doesn’t accept money back bonuses. Let us move forward and look into what they have for us. Below are their available offers and promotions. World Cup Qualifiers – If you have been betting on the world cup qualifiers, then this running promotion is best for you! Please be advised that this is a limited offer which means that this promotion will end within the second week of October. Basically, you get a boost on all of your bets that are listed on the provided link. ATP Shanghai Masters – This promotion only runs until the 15th of October 2017 and is one of the activated promotions that we are able to take advantage of. If you like to bet on Tennis matches then this would be great for you. What is the promotion all about? You get the chance to get your money back up to 30 mBTC in case your pre-live match bet doesn’t win. Awesome right? Read more about it here. NHL Shootout Moneyback – Place a pre-live bet on any NHL game and if your team loses, you will get your money back of up to 30 mBTC. This promotion is just the same as the one mentioned above, only for a different sport. Head to Head – This promotion comes in line with their Player Pros feature wherein you are able to bet not on the team itself but individual players of any available sport. For the head to head promotion, you will get the chance to win back up to 5 mBTC if your first bet loses. Please note that this is only applicable for first bets. Welcome Offer – We know that some of you guys have been itching to know what their welcome bonus is. For your first bet you will get x3 your stake in free bet. HellRaisers – HellRaisers CS: GO team was just announced to be officially sponsored by sportsbet.io, which is great! With this being said, every winning bet that you place on their new sponsored eSports team will get a 20% profit boost! You can read more about this here. For a website that doesn’t offer that much betting lines, this is actually impressive. Though their main niche of giving something back is based on your luck and is actually not a “Real” Bonus if you ask me. We still have to shell out money and if you’re an extremely lucky person then most of their promotions are useless to you. But hey, beggars can’t be choosers, right? Since we’ve now talked about most of the available games and promotions, let us move forward to Security. When money is involved, security should be one of your concerns as an online gambler. There are literally hundreds of sportsbook websites out there today, but most of them are shady websites that have zero reviews and is really scary to even touch or date deposit money into them. When looking for a legit website, you should put two things in mind, security and customer support. 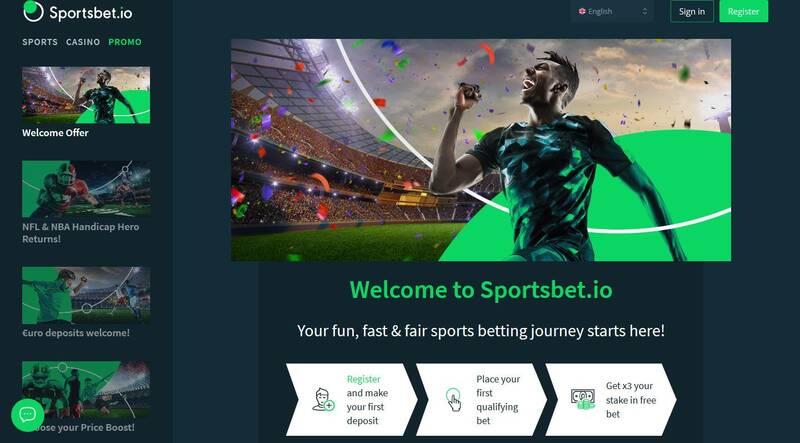 We will be talking about the customer support capabilities of Sportsbet.io later on in this review; for now, let us talk about their security and anonymity. Let us first tackle anonymity. When you create an account with Sportsbet.io, you will be given the option to do it within just ten seconds. The reason for this is that they do not ask that much information regarding the account that you will be making. You only need to have a username, email account, and the password for your new account and that’s it. We remember some gambling websites offer a lot faster options than this, but the minimal personal information required is what keeps the anonymity alive. When it comes to payments, they generally accept Bitcoin payments. This means that every transaction is virtually untraceable if you go with crypto currency (Bitcoin) payments. They are also a silver member of the Bitcoin Foundation and a registered company under the name of mBetSolutions N.V. under the Curacao eGaming which secures their eligibility to handle an online gambling website. With these bodies behind them, you are sure that your money goes to a legitimate website and not some shady one week wonder that you just ran into. When it comes to account security, there are two additional levels that can be added to an account. First would be the 2-Factor Authentication by using Google Authenticator and the other one would be the verification of your account. In order to verify an account, all you need to is to submit valid picture ID’s which can be used in the future with issues concerning account retrieval. Right after talking about security and anonymity, we need to talk about their customer support. Why do we think that this is one of the most important things when it comes to online gambling websites? It doesn’t need a genius to answer this very simple question. When a website handles money, may it be cryptocurrency or fiat, customer support is crucial. We need to make sure that on the back of that website there are real people looking into our real issues. 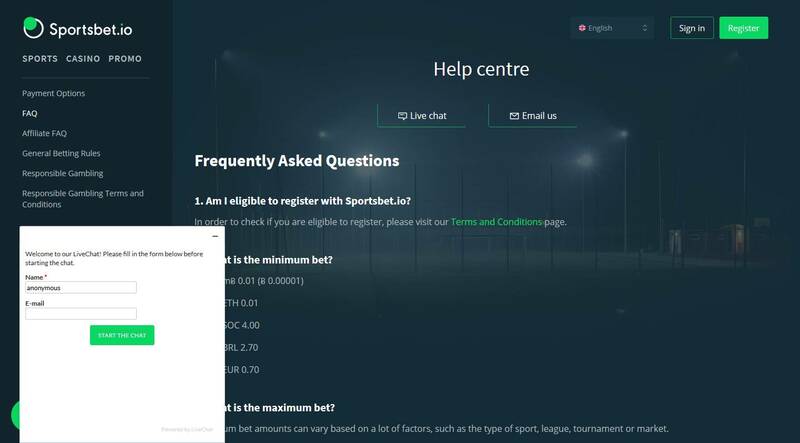 Here at Sportsbet.io, they have a couple of channels that you as a user can reach if you have any problems with your account or just simply have questions answered. They have a live chat support system which we are easily able to access by clicking on the small green circle located on the lower-right corner of the website page. Aside from their live chat support, they also offer social media connections. They have a thread started at Bitcointalk.org which can be found here. They also have Facebook, Twitter, and a blog wherein news are posted regularly. We were expecting something like a direct line or at least an email address for their support channels but the mentioned ones above are fine. It is fairly easy to bet on your favorite sports lines here at Sportsbet.io. First we, of course, need to log into our newly created accounts and head over to their sports tab. Once on their sports tab, select a game that you want to bet on. For today’s example, we will be looking into their Tennis lines. The chosen bet is between Ramos Vinolas, Albert vs. Carreno-Busta, Pablo. We have marked the important things that you need to put in mind when you are placing a bet with Sportsbet.io. Here are the enumerations below. Date – Make sure that you know which date you are betting on. Sometimes the website lags and it would select random dates that are shown on the calendar above. Make sure that you get this right before moving on to the matches. Match – This is where you choose the match that you are interested in betting on. You do not need to click anything yet, just take note of the match information. Bet Type – With this, you are able to choose which type of betting odds you want to go with. We are able to choose between Decimal, American, and Fractional. If you do not know what these means, then you might want to read more about betting these betting odds here. Once you have chosen the betting odds, just click which odds you want to bet on shown on the encircled decimal point shown on the screen shot with the number four beside it. Your bet slip will then show the selected odds in which you are now able to add the stake depending on how much you want to bet. 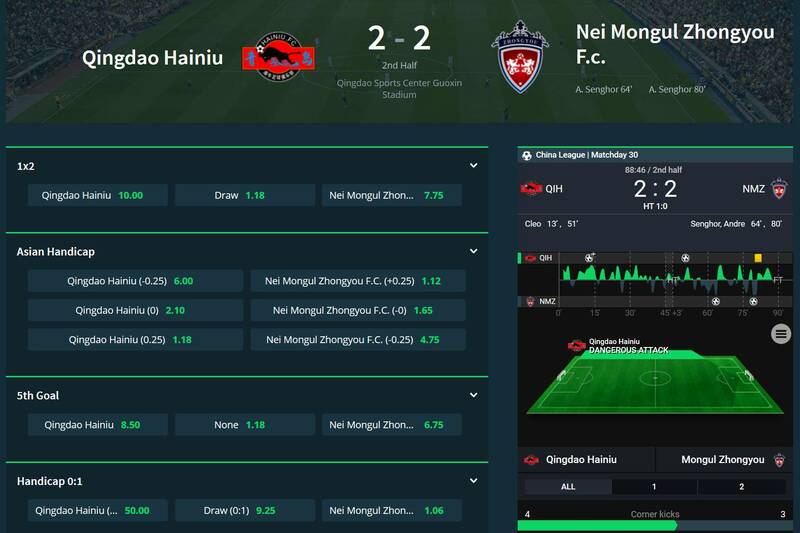 The betting process is really simple and if you have any troubles knowing where to click and whatnot, you can always refer to this review and look into our available screenshots. 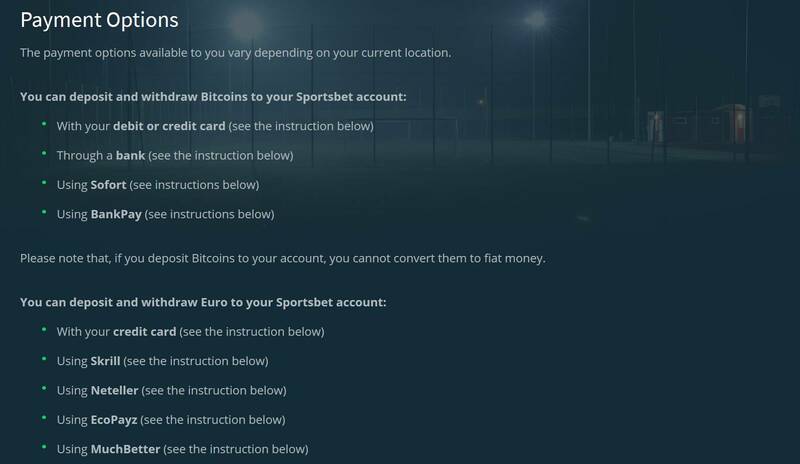 Despite having a Curacao license, Sportsbet.io only accepts payments in Bitcoin. This means that all transactions going in and out of the website is only done with the cryptocurrency. With this being said we all need to have a Bitcoin wallet that we are able to link to our account. In order to do this, just click on the wallet logo found on the upper-right corner of the account screen. Clicking this will open a separate tab with a generated unique wallet address for your account. Copy the address and paste it on your Bitcoin wallet and make the transfer. When it comes to withdrawals, you just need to provide your Bitcoin wallet address on the space provided and you will then be able to withdraw any amount into your wallet. If you do not have any Bitcoin available to use for placing bets, you can also click on the “Get Bitcoins” tab wherein you are able to buy Bitcoins using your credit card and seven more payment options. Below is the list of payment options available to purchase Bitcoin from them. Limits range from 0-100,000 EUR per transaction. Read more about this extra feature here. Impressions are always useful when it comes to reviewing a website of its performance and how they treat issues. Looking into what people say about Sportsbet.io is as important as knowing if they are a legitimate business or not. What are the people saying about them? One of the most common issues would be the withdrawal of money from their website. We’ve seen a lot of this particular issue being thrown at every gambling website out there today. I mean, just imagine how much money a business can make if they hustle every customer out of frustration? But with that being said, there should be no excuse when it comes to giving out a players winnings and taking the long route to withdrawals. Another issue that was discussed in a heated thread post would be the drastic change in their terms and conditions. What happened is that a player won several bets on one event. Due to the nature of sportsbook websites, we all know that we are able to place several bets in one event, right? The user thought that this was okay with the management since he asked the customer support several times about this and they confirmed it was okay. The user then got a reply from the management and told him that only the first three bets counted and that the terms and conditions were changed. Read more about this controversial issue here. We have looked into probably the most interesting gambling website out there today. With this being said, we think that Sportsbet.io is one solid website that offers different style promotions that keep their patrons happy. Though they clearly need to work with their negative issues, it is still a very young website that can improve over the years. 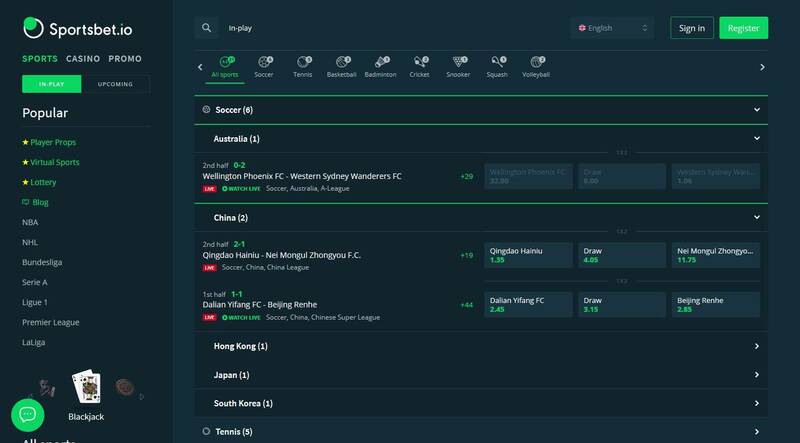 The betting interface is not obscured like some of the gambling websites and it doesn’t need a lot of “brain-power” to understand what is going on with your betting slip. Without the negative issues regarding their services, this website can easily be one of the greatest out there today. They offer a clean interface, wide range of odds and a mobile-friendly website, what more can we ask?